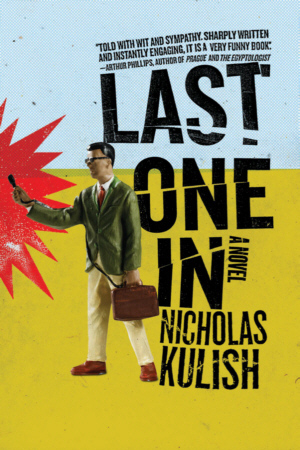 In LAST ONE IN by Nick Kulish, a young gossip columnist for a New York City tabloid arrives at work one day and learns that the newspaper’s war correspondent has been hit by a delivery truck, just as he was preparing to leave to cover the war in Iraq. With the war about to begin, the paper’s desperate editor decides to embed its gossip columnist with the Marines, dramatically ending his columnist’s easy life of black-tie parties and meaningless relationships with Manhattan models and aspiring young actresses. Darkly funny, this debut novel by Nick Kulish is a classic fish-out-of-water story sure to appeal to a large and appreciative readership. Nick Kulish is a journalism graduate of Columbia University. Kulish went to work for The Wall Street Journal in the paper’s Washington bureau, eventually leaving DC to cover the Iraqi war for the paper as an embedded reporter. He left the Journal to write fiction after winning a prestigious Fulbright Creative Writing Fellowship. Kulish currently lives in New York and works for The New York Times OpEd page, while also working on a second novel, set in Berlin.